Many have labelled this transformation of the Hijab from religious symbol to fashion icon as a furthering of the ’empowerment’ of Muslim women. But is it really? The Hijab itself is often presented by many Muslim women as a symbol of ’empowerment’ – that it reflects the rejection of the objectification and sexualization of women, the rejection of the pressures to conform to societal expectations of beauty and image, and the rejection of the physical and financial exploitation of women by the multi-billion beauty and fashion industries. 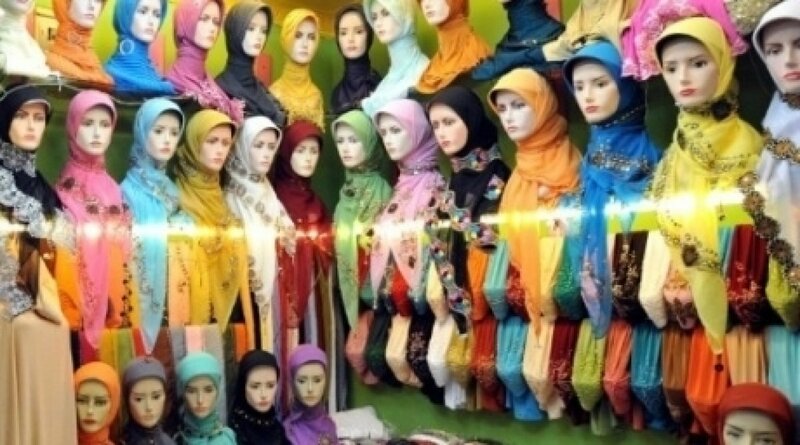 However, the disfigurement of the Hijab from a garment worn purely as an act of religious devotion to one that has become a fashion accessory has unfortunately taken the Muslim woman down a downward slope of disempowerment. This disempowering, disfigurement of the Hijab from a religious dress reflective of the modesty of the Muslim woman to that of a fashion statement that aims to enhance her beauty in society has evolved based on a number of flawed premises. Firstly, there is an erroneous belief that has lulled Muslim women into a false sense of self-reassurance – that Islam allows her to define or interpret modesty in dress in whichever way she desires: that ‘modesty is in the eye of the beholder’ and its ‘all about choice’. According to this principle, all forms of ‘headgear’ or ‘modest’ clothing – from turbans, bandanas, see-through dupattas and ‘half-way’ headscarves which expose the hair, neck or the ears, to figure-hugging and translucent clothing which cover the surface of the body but reveal what is underneath – have been endorsed as acceptable Islamic dress. The Prophet ﷺ said, «إِنَّ الْجَارِيَةَ إِذَا حَاضَتْ لَمْ يَصْلُحْ أَنْ يُرَى مِنْهَا إِلا وَجْهُهَا وَيَدَاهَا إِلَى الْمَفْصِل» “When a girl reaches puberty (indicated by starting the menstrual cycle), it is not right that any part of her be seen except her face and the two hands up to the wrist.” [Reported Abu Dawud]. In the verse, Allah (swt) orders the believing women to draw their khumur (plural of khimar -head-coverings) over her necks and juyub. ‘Juyub’ refers to the neckline of the woman’s dress or the upper chest. Women at the time of the Prophet ﷺ, prior to the revelation of the verse, used to cover their heads with the khimar, throwing its ends upon their back but in the process leave their necks, ears, and upper part of the chest bare. However, in the verse, Allah (swt) commanded them to cover those parts as well with the khimar. Imam ibn Kathir (RM) said regarding the verse, “Draw their khumur to cover their juyub means that they should wear the khimar in such a way that they also cover their chests so that they will be different from the women of the jahiliyyah who did not do that but would pass in front of men with their chests uncovered and with their necks, forelocks, hair and earrings uncovered.” Hence Allah (swt) orders the woman to cover her head, neck, and chest with her khimar. To cover these parts of the body also means that the clothing should not be transparent or translucent such that the skin can be seen underneath it, as this would not fulfil the obligation of concealing the awrah. Furthermore, when the woman leaves her house and enters the public life, Allah (swt) has obligated her to wear the jilbab – a one-piece outer garment which covers and conceals her home clothes and drapes down from her neck to the floor. Allah (swt) says, يَا أَيُّهَا النَّبِيُّ قُل لِّأَزْوَاجِكَ وَبَنَاتِكَ وَنِسَاء الْمُؤْمِنِينَ يُدْنِينَ عَلَيْهِنَّ مِن جَلَابِيبِهِنَّ ذَلِكَ أَدْنَى أَن يُعْرَفْنَ فَلَا يُؤْذَيْنَ وَكَانَ اللَّهُ غَفُورًا رَّحِيمًا “Oh Prophet! Tell your wives and your daughters and the women of the believers to draw their cloaks (Jalabeeb) all over their bodies.” [Al-Ahzab: 59] In addition, in one hadith narrated by Umm Atiyya (ra), she said, “The Messenger of Allah ﷺ ordered us to bring out the young women, the menstruating women and veiled women for the two Eid festivals. The menstruating women were to keep away from prayer yet witnessing the goodness and the dawa (address) to the Muslims. I asked, ‘O Messenger of Allah, what about the one who does not have a Jilbab?’. He said, «تلبسها صاحبتها من جلبابها»“Let her use the Jilbab of her sister.” [Reported by Muslim]. In this hadith, the Prophet ﷺ states clearly that wearing a jilbab is the condition that a woman must fulfil in order to enter the public life as he did not give permission for the one who does not have a jilbab to leave her home, rather he orders her to borrow one from her Muslim sister. This is the indication (Qarina) that the command for a woman to wear the jilbab when entering the public arena is an obligation. In Islam, guarding one’s modesty and public beautification of the woman are definitely mutually exclusive for there are clear Islamic rulings obliging the former and prohibiting the latter. Allah (swt) says,وَقُل لِّلْمُؤْمِنَاتِ يَغْضُضْنَ مِنْ أَبْصَارِهِنَّ وَيَحْفَظْنَ فُرُوجَهُنَّ وَلَا يُبْدِينَ زِينَتَهُنَّ إِلَّا مَا ظَهَرَ مِنْهَا وَلْيَضْرِبْنَ بِخُمُرِهِنَّ عَلَىٰ جُيُوبِهِنَّ وَلَا يُبْدِينَ زِينَتَهُنَّ “And say to the believing women that they should lower their gaze and guard their private parts, and that they should not show their Zeenah (charms or adornment) in public beyond what may be apparent.” [An-Nur: 31]. He (swt) also says, وَالْقَوَاعِدُ مِنَ النِّسَاءِ اللَّاتِي لَا يَرْجُونَ نِكَاحًا فَلَيْسَ عَلَيْهِنَّ جُنَاحٌ أَن يَضَعْنَ ثِيَابَهُنَّ غَيْرَ مُتَبَرِّجَاتٍ بِزِينَةٍ “And women of post-menstrual age who have no desire for marriage – there is no blame upon them for putting aside their outer garments [but] not displaying their adornment.” [An-Nur: 60]. And He (swt) also says, وَلَا يَضْرِبْنَ بِأَرْجُلِهِنَّ لِيُعْلَمَ مَا يُخْفِينَ مِن زِينَتِهِنَّ “And let them not stamp their feet to make known what they conceal of their adornment.” [An-Nur: 31]. These verses clearly prohibit the open display of Tabarruj (beautification) – the revealing of the beauty and charms of a woman to non-Mahram men. In addition, the Messenger of Allah ﷺ said, «صِنْفَانِ مِنْ أَهْلِ النَّارِ لَمْ أَرَهُمَا قَوْمٌ مَعَهُمْ سِيَاطٌ كَأَذْنَابِ الْبَقَرِ يَضْرِبُونَ بِهَا النَّاسَ وَنِسَاءٌ كَاسِيَاتٌ عَارِيَاتٌ مُمِيلاَتٌ مَائِلاَتٌ رُءُوسُهُنَّ كَأَسْنِمَةِ الْبُخْتِ الْمَائِلَةِ لاَ يَدْخُلْنَ الْجَنَّةَ وَلاَ يَجِدْنَ رِيحَهَا وَإِنَّ رِيحَهَا لَيُوجَدُ مِنْ مَسِيرَةِ كَذَا وَكَذَا» “Two are the types of the the people of Hell whom I did not see: people having flogs like the tails of the ox with them and they would be beating people, and the women who would be dressed but appear to be naked, who would be inclined (to evil) and make their husbands incline towards it. Their heads would be like the humps of the bukht camel inclined to one side. They will not enter Paradise and they would not smell its odour whereas its odour would be smelt from such and such distance.” [Reported by Muslim on the authority of Abu Hurayrah (ra)] The words “dressed but appear to be naked” refer to the revealing of the adornments and beauty of the woman, while the words, “Their heads would be like the humps of the bukht camel inclined to one side” are talking about revealing the beautification done to their hair, such as treating and heaping it around a turban or headscarf or anything similar until it became like the hump of a camel. In fact, Hayah is one of the main distinguishing features of Islam, for the Prophet ﷺ said, «إِنَّ لِكُلِّ دِينٍ خُلُقًا، وَخُلُقُ الْإِسْلَامِ الْحَيَاءُ» “Every way of life has its distinct characteristic. And the distinct characteristic of Islam is Hayah (modesty).” [Abu Dawood]. For the Muslim woman, having Hayah should also be coupled with the Order of Allah (swt) to avoid any action or situation which could constitute ‘Shubha’ – areas of uncertainty or that which is close to the Haraam. This is in order that she does not fall into disobeying her Rabb inadvertently, or creates suspicion regarding her Islamic character. The Prophet ﷺ said, «إِنَّ اَلْحَلَالَ بَيِّنٌ، وَإِنَّ اَلْحَرَامَ بَيِّنٌ، وَبَيْنَهُمَا مُشْتَبِهَاتٌ، لَا يَعْلَمُهُنَّ كَثِيرٌ مِنْ اَلنَّاسِ، فَمَنِ اتَّقَى اَلشُّبُهَاتِ، فَقَدِ اِسْتَبْرَأَ لِدِينِهِ وَعِرْضِهِ، وَمَنْ وَقَعَ فِي اَلشُّبُهَاتِ وَقَعَ فِي اَلْحَرَامِ، كَالرَّاعِي يَرْعَى حَوْلَ اَلْحِمَى، يُوشِكُ أَنْ يَقَعَ فِيهِ، أَلَا وَإِنَّ لِكُلِّ مَلِكٍ حِمًى، أَلَا وَإِنَّ حِمَى اَللَّهِ مَحَارِمُهُ» “Both halaal and haraam are evident but in between them there are doubtful things and most of the people have no knowledge about them. So whoever saves himself from these doubtful things, he would save his religion and his honour. And whoever indulges in these doubtful things would fall into haraam like a shepherd who grazes (his animals) near the hima (private pasture) of someone else and at any moment he is liable to fall into it. Oh people! Beware! Every king has a hima and the hima of Allah on the earth is what he declared as haraam things.” [Reported by Muslim on the authority of an-Nu’man b. Basheer] Consequently, the Muslim woman will strive to be diligent in her dress and appearance, ensuring that her clothes are loose and far away from anything which could constitute Tabarruj. Previous PostHow the Past Resembles Today…The Scenes Continue and So Do the Spectators!